New Autobag® 850S™ Bagger is designed for mail order fulfillment applications with a wide range of bag sizes up to 22 inches wide. 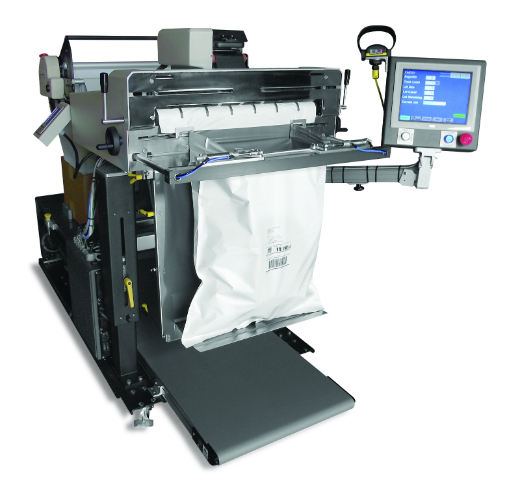 Automated Packaging Systems, the world leader in high-reliability bag packaging systems, is proud to introduce its newest and most advanced bag packaging system – the Autobag® 850S™ Mail Order Fulfillment Bagger. The Autobag 850S marries state-of-the-art engineering and superior ergonomics to create a mail order fulfillment system with a small footprint that is easy to use and inherently safe. The Autobag 850S runs mail bags up to 22 inches wide – two inches wider than any other fulfillment bagger on the market today. Innovative bag opening technology grabs and securely grips the bag in load-ready position, creating a pass-through up to 11 in. x 11 in., making it ideal for bulky or multi-item orders. This arrangement also enables the use of a smaller, more completely filled bag to reduce material costs. Gone are the bulky guards and awkward safety switches that are part of traditional packaging machines, replaced by a wide open loading area with pressure sensors that instantly pause the closing and sealing process if anything touches the bag loading mechanism. This unobstructed access improves productivity for faster operator throughput and more comfortable working conditions. An AutoTouch™ control screen provides quick access to job setup parameters, on-board diagnostics, data retrieval, performance monitoring, and a help system with operator tutorials. A compact thermal transfer imprinter is positioned in line with the next bag to be loaded and prints high resolution graphics, text, bar codes, and personalized data directly onto the bag, eliminating the cost of printing and affixing separate shipping labels. The Autobag 850S fully integrates with customer databases for personalized 1:1 mail order fulfillment packing and shipping. Bag size changeovers are easily accomplished in less than five minutes with simplified threading and a new tension control system that automatically centers and monitors the film throughout the bagging process. A modular bag storage shelf built into the bagger conveniently supports genuine Autobag pre-opened bag-in-box materials. Mail order fulfillment and shipping applications that can benefit from this next generation bag packaging technology include apparel, sporting goods, shoes, fashion accessories, automotive parts, hardware and plumbing accessories, nutraceuticals, pharmaceuticals, and a wide range of internet-based products in medium to large volumes. Automated Packaging Systems has been designing and manufacturing original Autobag®, AirPouch® and SidePouch® systems and products for over 50 years. With more than 30,000 packaging systems in operation and a worldwide service organization, Automated Packaging Systems has the experience and support to deliver the ultimate in customer satisfaction. Automated Packaging Systems offers a complete line of baggers, void-fill and protective packaging systems, thermal transfer imprinters, counters, scales, and specialty packaging materials. Complete information is available at the company’s website.